This is the last lot of caps from The Farewell Party scene, but, as you can see, I've saved the best for last. These are taken from Frodo's reactions shots, beginning with the end of Bilbo's "goodbye speech" until Bilbo slips on the Ring and disappears. Screencaps from this sequence have always made me swoon with aesthetic and amorous pleasure, but I only had a few of them saved into my files. Now I have a whole string. Goody, goody, goody! 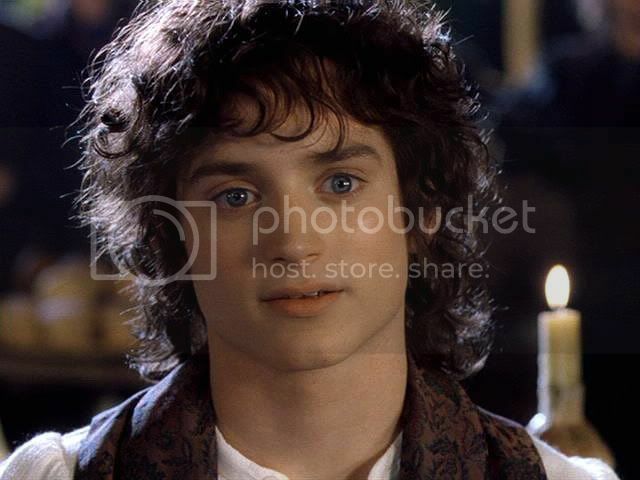 Frodo looks like SUCH a Baroque angel to me in these, he is beyond anything mortal. The soft lighting brings out his glow; his face looks like burnished gold. His curls for these shot look thicker and lusher and softer than ever. And his face! 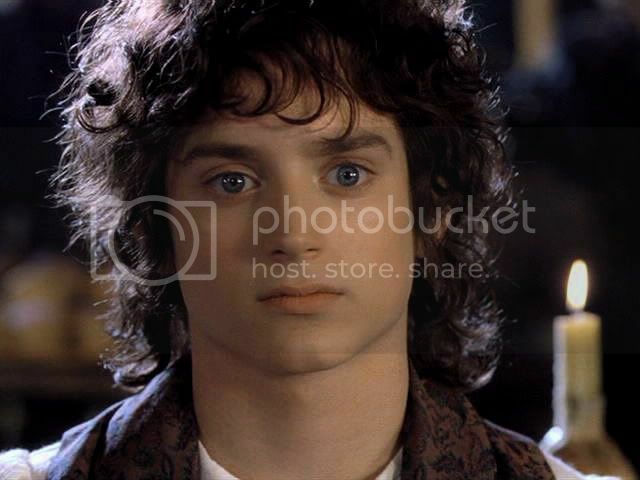 Frodo's reactions in this section allow his face to move from amused expectation to startlement to awe. In registering these particular emotions, Frodo's face is drawn to arrange itself in some of its most ravishing attitudes: his eyes, already large and expressive, become even more so. They start out softly luminous, with an amused smile barely playing about his lips. But then, as Bilbo disappears, they open like windows until they are so large the smitten viewer could fall into them and never stop falling. The mouth and jaw, no longer pursed or stretched by laughter and speech, relaxes as Frodo gazes at Bilbo. He begins with a slight smile, as if waiting in amused suspense. The pearly little teeth look sharp and slightly feral. I long to feel them nibble and bite. The lips we so often liken to the petals of flowers are soft, growing fuller until they nearly pout. Could a man's lips be that succulent-looking? That ripe and luscious? Then, as Bilbo disappears, the jaw drops, the throat relaxes and his neck looks more powerfully thick and male than ever. Have I said how that neck *stirs* me? His mouth drops opens in surprise. There is velvety darkness behind the parted lips but a tooth glistens wetly, winking as it catches the reflected light. Kept steady in a screencapture, it gleams out from between his parted lips like a small star. 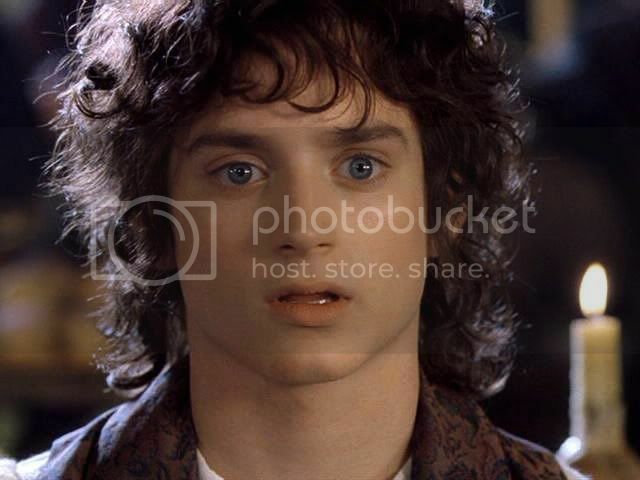 What Frodo fan has not felt herself mesmerised by that dental glitter, left to wonder stupidly, "Could that be the "inner light" Tolkien was talking about...?" *Not worthy* to look at such beauty. My dear, dear, Estë: You are worthy, you are! 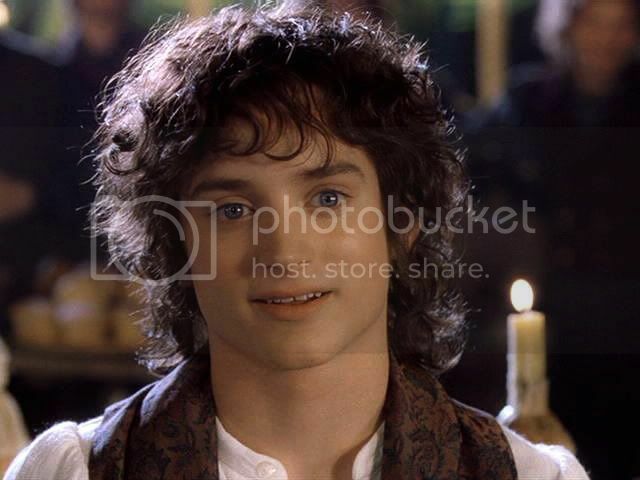 Frodo has told me so! Let's see ... in the Harem appointment book I see your name inscribed for a double slot -- this very night. It's not my handwriting; it's not yours. Whose, then? Exactly. "Not worthy to look at me?" the Squire exclaimed to me when I told him. "It is I who am not worthy to be so looked at! Tell her to come at once [and look at me]!" *Swoon* Don't you have to love a fictional character like that? You know how I feel about this sequence of pics! I remember the first time I saw it (your pic No. 5). I just had to make it into a wallpaper. So every time I opened my computer, there he was, looking at me so much like an angel... It was enough to make me weak at the knees! Maewyn, I thought of you, of course, as I made the screencaps. Ah, how we have sighed and dreamed over #5. It really is the pearl of great price from among this sequence. But, even so I love even better to see it in context, set between gems that are only slightly lesser in loveliness. Ooooh, Maewyn, all weekend I've been making caps from the "Extras" of the theatrical FotR set. I'd never seen them, but over and over I'd see glimpses of Frodo I've seen as caps in galleries. I even found the origins of that really tight closeup of Frodo that looks as though it's from the Lorien scene of him looking at Galadriel, but without the blue grading. I made ten or so caps of the sequence. Drool. 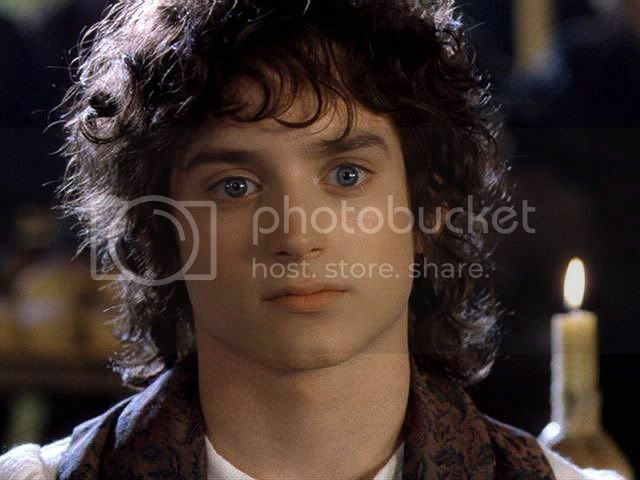 I even found the origins of that really tight closeup of Frodo that looks as though it's from the Lorien scene of him looking at Galadriel, but without the blue grading. I made ten or so caps of the sequence. Drool. And it's off to bed with me! Oh yes. So nice to have company in the wide eyed staring at this incandescent sequence for long periods of time.. And to read your expressive discription of it makes the heart beat faster. And yeah.. That male neck. I don't think I had ever seen that last one captured by anybody before. It makes the heart flutter. That oh-so-slightly raised eyebrow and wide, compelling eyes.. sculpted nose, and perfect jaw. but it is his mouth that irresistibly draws the eye. The texture and obvious softness of his lips. I am sure you have noticed that you can taste them if you look at this one long enough. And yes.. number 5. The screencap that launched a thousand dreams. Thanks.. these go in my Frodofile. As I said to Maewyn in the post above you, I've been making more. Few or none have a better front-view neck, though, or a better, more full-lipped wide-eyed look.